The 2018 Active-Aging Industry Trends Survey, Visions of the Future, queried respondents from a variety of organizations that work with older adults about their adoption of technology over a time horizon from 2019 to 2023. The group included 322 managers and staff of senior living communities. Topping the list of tech items they are already looking into or likely to provide by 2023 were biometric wearables (to measure body temperature, hydration, etc. ), apps to track diet and exercise, virtual reality headsets, and wearable activity trackers like Apple Watch and FitBit. Tech companies should heed a potential speed bump on the high-tech highway exposed by the survey. Under half of senior living respondents said they were happy with current levels of training accompanying new devices or software. Yes, the Millennials love their Bluetooth earbuds and Alexa smart speakers. But according to a recent survey by the International Council on Active Aging® (ICAA), new tech is also finding a home in senior living communities. Of course, no one knows for sure what sorts of amazing new devices are just around the corner. But in the survey, close to half (46%) of respondents already own or expect to be buying within five years what turned out to be the most popular category, biometric wearables. Even the fourth, fifth and sixth-rated items were earmarked by more than a third of respondents – a tie at 37% apiece – including Alexa-like voice-activated assistants, robots for medication or health checks, and GPS trackers. Why do older adults even need new technology? GPS trackers that fit inside the soles of shoes (for example) could be of particular benefit to residents and staff in memory care. Biometric wearables enable senior community residents with heart or diet issues to self-assess easily and often. New tech devices also give communities and their medical teams a means to monitor shifts in health patterns. 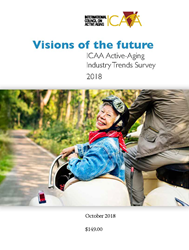 Taking responsibility for one’s own health is a key component of the worldwide wellness revolution, which according to ICAA’s Visions of the Future survey promises to dramatically alter the culture of senior living communities. A clear majority of staff and managers from such communities taking part in the survey – 59% – forecast that their business model would be based on a wellness lifestyle with options for care by 2023, rather than the opposite and more traditional model based primarily on the provision of care with options for wellness. The changes typically manifest in the form of expanded programs in multiple areas of wellness, healthier diets, more activities and more emphasis on prevention and quality of life than cures. Tech companies should heed a potential speed bump on the high-tech highway exposed by the survey. Under half of senior living respondents said they were happy with current levels of training accompanying new devices or software, and regardless of delivery method – internet, staff, sales, residents, supervisors or outside experts. The findings indicate tech suppliers need to communicate better. The survey was completed by 673 individuals from a variety of organizations. Those broadly categorized as senior living and care comprised 58%; community/senior centers and government or nongovernmental agencies made up 16%; colleges, therapy clinics and in-home services comprised 14%, and fitness clubs and studios, parks and recreation organizations and other organizations serving adults 50 and over made up 12%. ICAA, a professional association that leads, connects and defines the active-aging industry, supports professionals who develop wellness facilities, programs and services for adults over 50. The association is focused on active aging -- an approach to aging that helps older adults live as fully as possible within all dimensions of wellness -- and provides its members with education, information, resources and tools. As an active-aging educator and advocate, ICAA has advised numerous organizations and governmental bodies, including the US Administration on Aging, the National Institute on Aging (one of the US National Institutes of Health), the US Department of Health and Human Services, Canada’s Special Senate Committee on Aging, and the British Columbia (Canada) Ministries of Health and Healthy Living and Sport.